^ Kaplan, Thomas (August 2, 2010). "Four New Inductees In Mets Hall of Fame". The New York Times. Retrieved 2011-09-03. ^ "Mets Hall of Fame". New York Mets. Retrieved 2011-08-14. 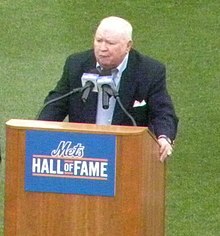 ^ "Mets Hall of Fame and Museum". New York Mets. Retrieved 2011-08-14. ^ Davidoff, Ken (April 15, 2009). "Mets Hall of Fame will be displayed at Citi Field". Newsday. Retrieved 2011-09-03. This page was last edited on 24 June 2018, at 21:06 (UTC).